BMW started in the manufacture of aero engines and motorcycles, it was with the acquisition of the Dixi works at Eisenach in 1928 that BMW entered the motorcar market. The early Dixi cars were essentially Austin 7’s built under license, although they soon made several improvements to the design, but BMW had greater plans for their new car department. In 1933 came the first ‘true’ BMW car, the 303, which had a twin tube frame, rear swing axle and a 6-cylinder engine. BMW’s reputation as a manufacturer of sporting motorcars really started with the annual Eifelrennen event, held at the Nürburgring on 14th June 1936. Here Ernst Henne beat a field that included 1½-litre single seat racing cars driving the prototype of what would become one of the most iconic sports cars of all time – the legendary ‘328’. The fact that this victory had been achieved only eight years after BMW’s establishment as an automobile manufacturer is all the more remarkable. Capitalising on this success, the company launched a new range of models that would become the foundation of their reputation as a manufacturer of the highest quality cars with power and style. The flagship of the range was the 328 that incorporated a lightweight tubular chassis and a powerful straight 6 engine with overhead valves and triple carburettors. Alongside the 328, was the 327 which was the companies sports tourer of the range. Based on a shortened, boxed, ladder-type chassis it had semi-elliptic rear springs, a Hurth 4-speed gearbox and hydraulic brakes all round. The BMW 327 was available with a choice of two engines, one was the companies standard 6-cylinder but for an extra cost the car could be fitted with the 328’s 80hp unit. This high power unit was the masterpiece of designer Rudolf Schleicher and although only displacing 1,971cc, the engine had hemispherical combustion chambers, inclined valves without the recourse to overhead or twin camshafts and twin down draught inlet ports giving a very credible 80bhp output in standard tune. This design had two rocker shafts, one situated above each bank of valves, giving the engine an external appearance almost indistinguishable from that of a twin-overhead-cam design but with considerable cost saving. This engine not only went in the BMW 328 and 327 as we find here but also after the war would be used by Cooper, Bristol and Frazer Nash with great racing success. The car we are proud to offer here is a rare 1939 Frazer Nash example of the beautiful BMW 327 Cabriolet. Frazer Nash were the BMW agents from 1934 and so the cars were sold as Frazer Nash–BMWs and these RHD cars were available with a number of bodies some by British firms and others with German bodies. AFN Ltd imported LMF 225 into Isleworth in July 1939 and it is the 2nd last of this model to make it into the UK before the outbreak of war and perhaps for this reason the car was not first registered until 1st of June 1940. 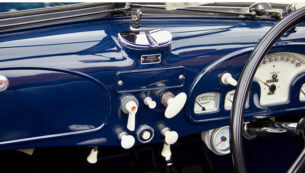 The early ownership of the car is not known until Jack Simpson of Ashcroft in Lancashire acquires the car in 1956, selling it to David Storey in 1962. David kept the car until 1985 when Hargreaves Massey takes ownership before selling it to Robert Fell in 1997. In 2000 the car is acquired by the well known BMW specialist restorer TT Workshop who sold the car in 2003 to an American client, Mr Stephen Glock of Maryland USA for no cost on the grounds that they would get to restore the car on his behalf. The restoration of the car at TT Workshop was extensive to say the least and would take 6 years to complete. Sadly Mr Glock never got to take delivery of his car and it was sold near the end of its restoration to the current owner who took delivery directly from TT. Due to the amount of work that was carried out during the restoration it is rather difficult to list everything done and there are over 50 invoices on file from TT giving detailed explanations to all work carried out. A very brief overview of some of the work carried out to LMF 225 includes a full engine rebuild, suspension, brakes and hubs all stripped and gone through, new hood and interior, new seals and gaskets throughout, fuel pump and new fuel lines, radiator, hoses, the body was stripped repaired and repainted, seats rebuilt and repaired. It would be fair to say that every part of the car was gone through and had some attentions during this complete rebuild that came to a cost in excess of £197,000. Following this work the car had a number of ‘shake-down’ issues while running it in, as is common to all big restorations, and a further £35,000 has been spent, mainly with renowned classic specialist Steve Stanton getting the car to the fabulous condition it is now in. This BMW 327 started out as 1 of only 19 Frazer Nash-BMW 327/80s when it was imported almost 80 years ago and there are now only 12 known to have survived. Of these high-powered, sports tourers we do not know of any that equal the simply stunning condition of the car we have here. This eminently usable car is available for immediate inspection.